Okay, first I featured a charming little book filled with heart-warming tales about the author and the sometimes zany, sometimes heroic, all-the-time lovable dogs in her life here on the Blog-Zine, and you loved it. Now, I'm featuring a book like no other - an equally charming little book filled with heart-warming tales about dogs and the sometimes zany, sometimes nerve-wracking owners in their lives! Why do dogs eat furniture when there are endless chew toys nearby? Why do they always dash to a rug when they have to throw up? And why are they always absolutely starving? 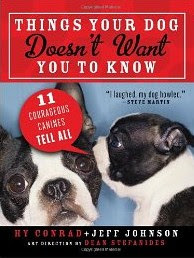 Things YourDog Doesn’t Want You to Know answers the questions that dog owners have asked for centuries. The book is a collection of 115 humorous essays that reveal the truth behind some of the most baffling canine behavior, their hopes and dreams, their grudges and pleasures, and what they really think about us humans. Peppered with lively, clever stories and visually appealing photographs, Things Your Dog Doesn’t Want You to Know is a verbal and visual delight that is laugh-out-loud funny. If you have dogs, love dogs, or have ever been baffled by a dog, this book is a must-have! ABOUT HY CONRAD: Best known for his work in mysteries, Hy was one of the original writers for the groundbreaking series, Monk, working on the show for all eight seasons, the final two as Co-Executive Producer. In a related project, Hy was Executive Producer and head writer of Little Monk, a series of short films featuring Adrian Monk as a ten-year-old. His latest TV work was as writer and Consulting Producer for White Collar. Hy is also the author of hundreds of short stories and ten books of short whodunits, which have been sold around the world in fourteen languages. 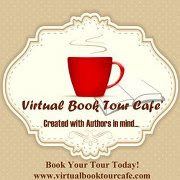 Hy’s first mystery novel series, Abel Adventures, will debut in 2012 with the publication of Rally ‘Round the Corpse. And his first full-length comedy/mystery play, Home Exchange, premiered at the Waterfront Playhouse in May 2012. He lives in Key West with his partner and two miniature schnauzers. ABOUT JEFF JOHNSON: Jeff spent most of his working life in advertising agencies, currently as General Manager of Cramer-Krasselt in New York City. He is the author of The Hourglass Solution: A Boomer’s Guide to the Rest of Your Life and co-authors (with Paula Forman) a national online advice column called Short Answers, which also appears in newspapers all along the east coast (from Massachusetts to Florida). Jeff lives in Vermont and Key West and is on the Board of Directors of the Waterfront Playhouse and the Florida Keys SPCA. 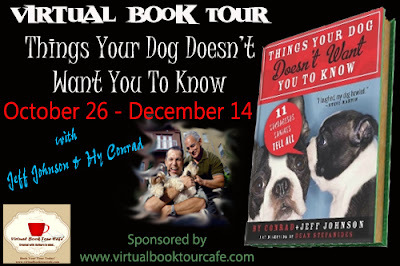 Join Hy Conrad and Jeff Johnson on the Things Your Dog Doesn't Want You to Know Virtual Book Tour. Click HERE or on the banner below to find out where they'll be stopping next and to enter to win a copy of Things Your Dog Doesn't Want You to Know for your own personal library! Also, visit Hy Conrad's official website and learn more about the book HERE! When I read the book, I looked over at my dog and wondered if that was really what she was thinking. Probably. Thanks so much for your support and kind words about my new book. It was great to be a guest on your terrifically entertaining blog.